Django Suit - Modern theme for Django admin interface. Django Suit is alternative theme/skin/extension for Django admin app (administration interface). Django Suit is licensed under Creative Commons Attribution-NonCommercial 3.0 license. 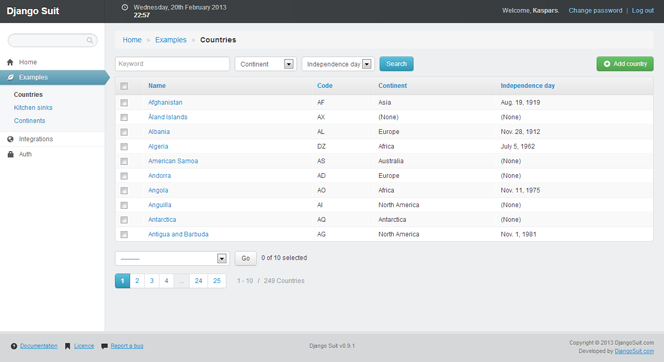 There are handy widgets included in Django Suit. Sortables are handy admin tools for ordering different lists. Form tabs help you organize form fieldsets and inlines into tabs. Django Suit provides handy shortcut to include templates into forms. Using few callable helpers you can customize change list row and cell attributes based on object instance variables. How to use wysiwyg editors in Django Suit. Github: Use django-suit github issues, if you have any problems using Django Suit. If you are using third-party apps with special admin support (like django-cms) you also need to add 'suit' before 'cms' in the list of `INSTALLED_APPS` in your `settings.py` file. © Copyright 2013, Kaspars Sprogis (darklow). Revision 9dca5bf5.